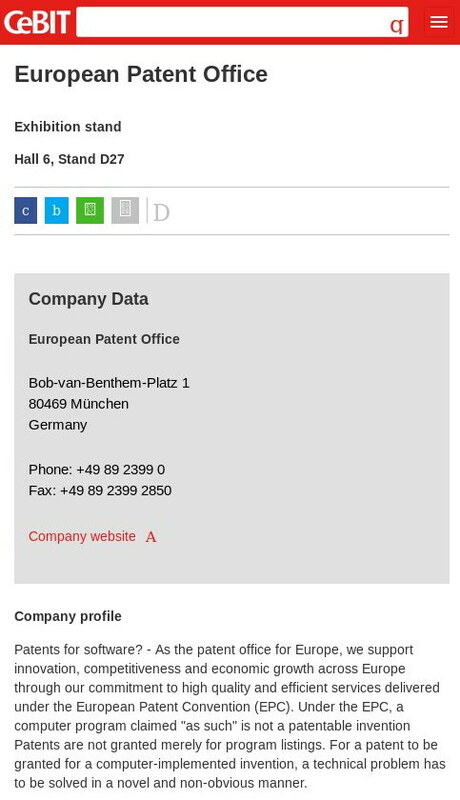 Yesterday morning at around 9AM (CET) the EPO’s Twitter account made it known that it would attend a corporate expo, CeBIT. I quickly linked to that, instantaneously criticising what seemed to be affirmation of the EPO’s now-notorious corporate tendencies. Shortly thereafter we also got mail alerting us or notifying us of the fact that the EPO would be attending CeBIT. The rogue thing, however, wasn’t the attendance itself but the part which said “Company profile” (yes, company, as it’s corporate). It also said “Product categories” (yes, product) and it specifies: “Services and consulting relating to patent protection and trademark protection, intellectual property” (actually, intellectual property is just a vague umbrella term which encompasses different laws, including trademarks, copyrights, and patents, which are inherently different things that oughtn’t be lumped together and treated similarly). The Alice Case Continues to Smash Software Patents (This Time OpenTV’s); Will the EPO Ever Pay Attention?